A unique story of a special bond. This is an ever so sensitive story that shows a very unique bond between an aging lonely person and a homeless child. The care and love that develops between the two proves once again that love is possible from a non biological father towards a child that is not his son. One that raises a child, knows him well, and wins his trust becomes actually a father figure for any child. 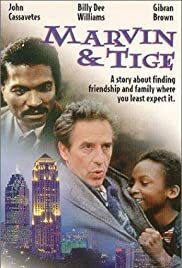 Tige, the colored little boy was played perfectly by a little child managing to steal the hearts of us all. The moral of this film is that only sincere feelings can create unique bonds. Marvin expressed such sincere feelings towards little Tige. Only by acting in such a manner could he reach this kind of special bond. Marvin's courage and honorable sacrifice must be admired, he gives up the most precious thing in his life and retreats back to his lonely and bleak life. The end of this lovely friendship ends so tragically for Marvin but in a very justified way for Tige. This film is greatly recommended for improving parental qualities and skills.